Vidyalankara, Shastra-Chudamani, SangitaKalaratna, Veda Kamala, Professor Saligrama Krishna Ramachandra Rao is well-known scholar who combines traditional learning with modern research. Well versed in Sanskrit, Pali, Ardhamagadhi and several modern Indian languages and acquinted with Tibetan and some European languages, he has written extensively on Vedanta, Buddhism, Jainism, Indian Culture. Art and Literature. In his professional career, however, he was a Professor of Psychology. He has headed the Department of Clinical Psychology in the National Institute of Mental Health and neuroscience, Bangalore. and the Department of Indian Culture in the Collision College Study Center of the University of the Pacific (U.S.A.). He has written more than sixty books in Kannada, a play in Sanskrit, and a Pali commentary on a Buddhist classic. One of this books on Iconography in Kannada has won the State Sahitya Academi Award, as also another of his books on the Tirupati Temple. Among his numerous English Publications are: there volumes of Encyclopaedia of Indian Medicine (Popular Prakashan, Mumbai), Tibetan Tantrik Tradition and Tibetan Meditation (Arnold Heinemann, Delhi), Consciousness in Advaita, and a series of six books on Indian temples (IBH Prakashana, Bangalore) and Origins of Indian Thought (Bangalore University); Kalpatharu Research Academy has published his Pratima-Kosha in six volumes. Agamakosha in Twelve volumes, Art and Architecture of Indian Temples in three volumes. 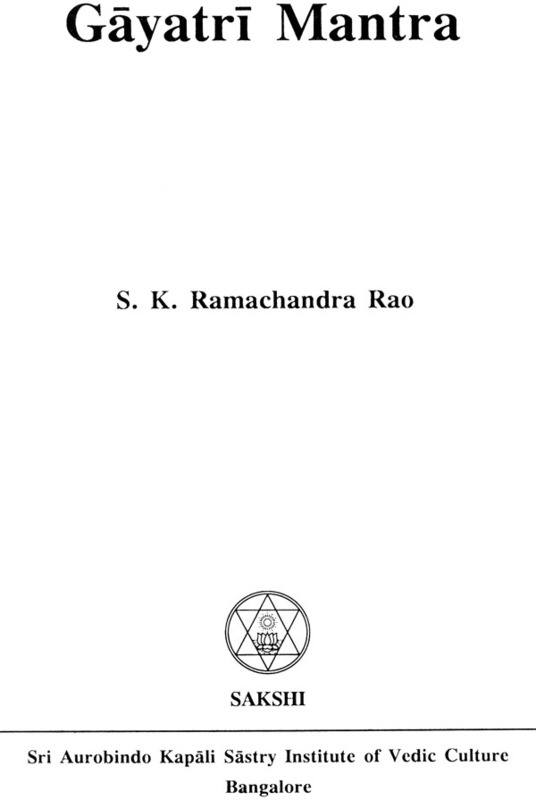 His detailed translation and essays on the highlights of Veda is in Rgveda-Darssana, published in 18 volumes. Tradition accords unrivalled importance to the Gayatri Mantra, which is the tenth rik in the third mandala of the Riksamhita. It is the mantra that is most frequently recited in the country by those who are spiritually inclined; it is among the texts that are daily recited by the devout. This has been so for several thousands of years. There, is no Vedic hymn which is regarded as more sacred, or more efficacious, by laymen or masters of scripture. In the Vedic literature itself, it is repeatedly mentioned, explained and annotated. Its prescription comprehends both ritualistic involvement and philosophical inquiry. 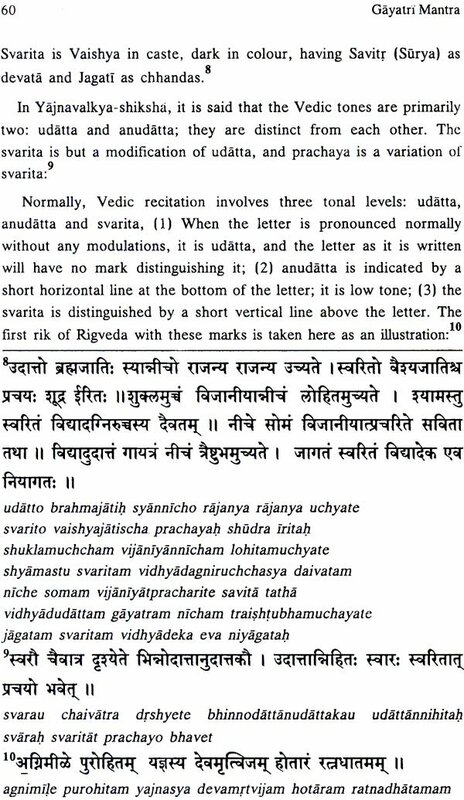 Although the text of this mantra, containing not more than twenty-four letters, is originally found in Rigveda as mentioned above, it also occurs in Ssme-vcde (2,812), Vajasaneyi-samhita (Shukla Yajurveda, 3,35;22,9;30,2 and 36,3), Taittiriya-samhits (Krishna Yajurveda 1,5,6,4 and 84;4,1,11,1), Maitrayania- semhita (4,10,3 and 14,9,14), Aitsreye-brahmana (4,32,2;5,5- 6; 13,8 and 19,8) Kaushitaki-brahmana (23,3 and 26,10), Gopathe-brahmana (1,1,34), Shatatha-brahmana (2,3,4,39; 13,6,2,9 and 14,9,3,11), Taittiriya- aranyaka (1,11,2 and 10,27,1), Sama-mantra-brahmana and (1,6,29), Daivata-brahmana (3,25). Several upanishads like Brhadarankyaka (6,3,11), Mundaka (6,7,34), Shveteshvatara (4,18), Kaushitaki (91,6) and Mahanarayaniya (15,2), seek to explain the import of this mantra, which is prescribed prominently in all the mediaeval Shrauta and Grhya texts (e.g. Ashvalayana-shrauta 7,6,6, Apsstsmbe-gttiys 4,11,9 and shrauta 20,24,6, Baudhayana-dharma, 2,10,17,14, Shankhayana-shrauta 2, 10,2; 2, 12, 17; 5 ,5,2; 10, 16, 17 and 10,9, 16 and Manava- shrauta 5,2,4,43). Other ritual texts also (like Rigvidhana 1,12,5 and Apastamba-mantra-patha) eulogize this mantra. Several puranas contain explanations of the mantra, legends about the goddess Gayatri, and prescriptions concerning the employment of the mantra in rituals and meditation. There are also Sandhyabhashyas (like Khanda-rajadikshita's Teittiriya- sandhya-bhashya, Sayana's Teittiriya -sandhyamentra- vyakhya, and anonymous Sandhyamantra-vitti), which explain the meaning of the Gayatri-rnantra both ritualistically and philosophically. 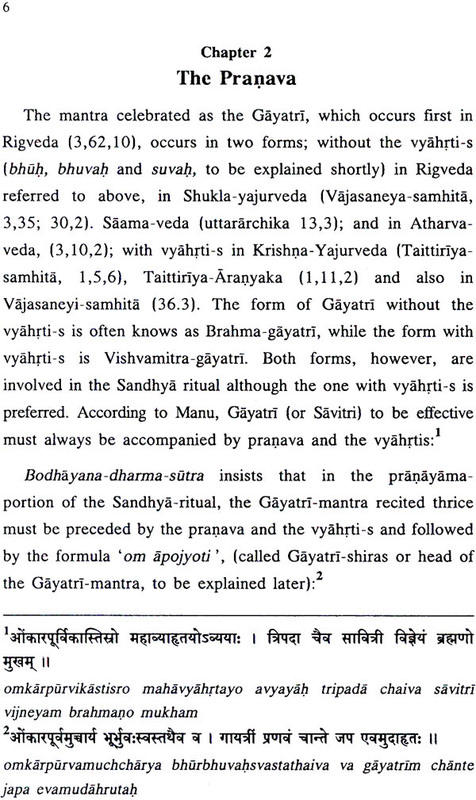 Gayatri is actually the name of one of the metrical forms (chhandas) adopted in Rigveda. And this metrical form is an important one. In Rigveda-samhita, out of the total 10,552 mantra-s, as many as 2,456 mantra-s (including the seven Valakhilya-sukta-s) are in Gayatri chhandas. This is only next to the trishtup-chhandas, which has the largest number of mantra- s (4,251); after Gayatri comes Jagati with 1,346 mantra-so It is also to be noted that the samhita-s of all the Vedas (excepting Krishna Yajurveda) begin with mantra-s in the Gayatri-metre. And among the numerous metrical forms used in the Vedic lore, Gayatri is the shortest (with twenty-four letters) and is also regarded as the most basic, the very first. We can see that Gayatri even as a chhandas is credited with great sanctity, and all mantra -s in this chhandas are of especial significance. It is especially so because this chhandas is associated with Agni, the first and foremost of devata-s in the vedic corpus, and the devata without whom no ritual can be performed. Trishtup-chhandas is likewise associated with the devata Indra, and Jagati-chhandas with the Vishvedevas. Shatapatha-brahmana (6,1,3,19) says that this mantra in the gayatrichhandas is Agni himself ('gayatri va agnih'; of also Taittiriya-samhita, 2,2,5, 'agnir vai gayatri'); the gayatri-chhandas is particularly suited for eulogizing Agni ('gayatram agneshchhandah'). This is why in all sacrificial rituals, the mantra-s that are first recited are in this chhandas. 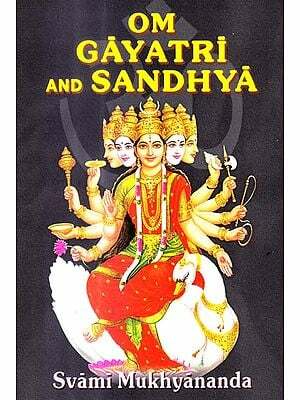 The mantra that is now celebrated as the Gayatri is no doubt in the gayatrichhandas with all these associations. But this is not its only claim to the extraordinary importance that this mantra has acquired in tradition. The real significance of the mantra is that it articulates, as few other mantras do, the special merit of the gayatri-chhandas. 'This mantra called Gayatri has the gayatra-chhandas, but it also protects one who chants it, and that is why it is called Gayatri'. We have in Chhandogya U. (3.12.1)1 a statement to this effect: the Gayatri-mantra is indeed the most fundamental speech; and this speech is all this, and Gayatri is so named because it articulates effectively as well as protects. 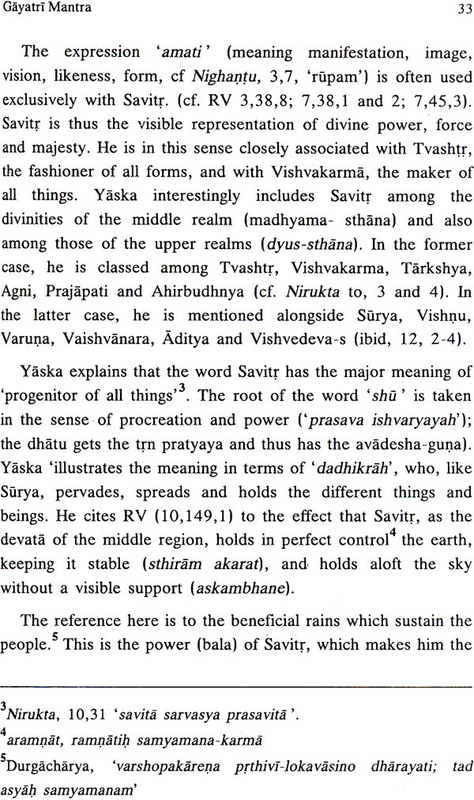 There is another ancient explanation given by Yaska, which IS rather intriguing. Gayatri is merely a camouflaged expression for trigaya. The expression 'trigaya' means "having three modes of articulation, mind, speech and body". That is to say, Gayatri finds expression in, or inspires, our mental processes, speech behaviour and physical acivities. 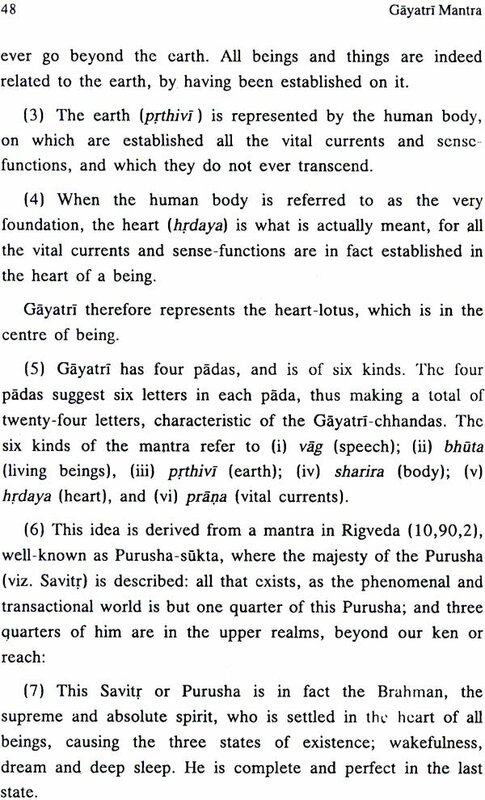 Further, Shatapatha- brahmana (14,8,15,7) interprets 'gayatri' to signify that it protects the life-principles (praIJa), which are called 'gaya'. Brhad-yajnavalkya-smrti explains that by reciting this mantra, one gets protected from various evils (like accepting gifts and consuming impure or improper food) and from major and minor. This idea is repeated in all Smrti texts and purana-s, so much so that the present understanding of the merit of the Gayatri- mantra is that it is capable of protecting the person who recites it. In fact, the Smrti texts tell us that if one repeats this mantra ten times, all the minor unbecoming omissions and commissions done during the day and that night will be eliminated. ; if a hundred times, a host of sins will be destroyed ('papaugha- shamani); if a thousand times, even the great sins, committed knowingly or unknowingly, will be rendered null and void; and if a lakh times, the sins of seven lives will be undone; and if a crore of times, whatever one desires will be secured. One of the texts pointedly asks what it is that would be impossible to achieve when the mantra is well recited.